Singapore Airlines (SIA) stories of stewardesses, stewards of more than 10 years by Boh Tong : Were the 5 SIA crew on their way to Ashburton some 53 kilometres away? Were the 5 SIA crew on their way to Ashburton some 53 kilometres away? The motor accident involving the 5 SIA crew happened at Rolleston which is approximately 24 kilometres from Christchurch where the crew stayed (refer to above map). 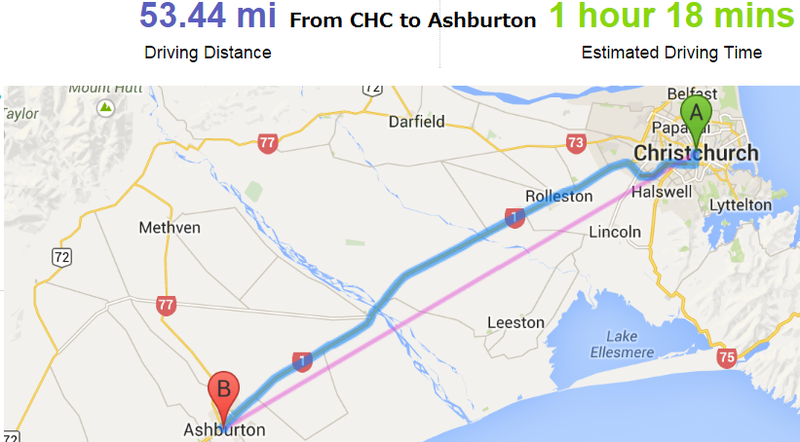 Someone told me they were on the way to Ashburton another town 53 kilometres away. They were supposed to visit the town’s main museum (there are six museums in Ashburton, including a vintage railway museum, aviation museum and car museum) as well as the local art and craft galleries. Included in their tour itinerary was also the nearby rivers which are known for salmon and sea-run trout. The accident at Rolleston in which the chief steward and a stewardess was seriously injured cut short their trip to Ashburton. If the pilot was a gambler and spent his time gambling in the Christchurch casino then the accident would have been avoided. What do you think BT? Yes Ex Gambler I totally agree with you. Or if the FO is a drinker and spends his time in the pub then the story would have been different too. The FO is a show-off driving at high speed to impress the 3 other girls. Can imagine them screaming and laughing whenever he took the corners and bends at high speed. Boh chai see now left 2 seriously hurt. CS should not have got involved but instead hang around the hotel with IFS Mir Hassan. Understand if they were to travel beyond certain radius from hotel, they must seek permission right? Are they covered by company insurance? If not, can claim from the FO? 50 km radius is allowed. The accident is 24 km away so it is covered by insurance. Can never understand why most of these stupid first officers bother to invite the cabin crew to tag along to the factory outlets or sightseeing. They always end up in charge of hiring the car and being the driver as well.The usual cabin crew excuses are they can't drive.Don't they know that they will always be blamed by the ungrateful cabin crew when things don't turn out as planned? Better to lie that you have no plans, and then quietly go yourself ! This is the way to hook the stewardesses ma. You think fo so nice invite crew go out be driver ah..
should know fo ask male crew is formality nia..
May this be a good lesson learnt for all the stupid FOs.. Do not bother to let the cabin crew know when you are hiring a car. Also, at the hotel lobby, please collect your room key and fo, and not hang around waiting for invitation for makan. Leave the stewardess for the poor and loser male cabin crew. Off duty, really no need to wayang...5 yrs junior, please take up some courses to improve your English..atrocious! Got prize? Go be English teacher la..
"Off duty, really no need to wayang..."
Their parents and loved ones would be able to enjoy these without paying for an arm & leg at Takashimaya. Packed in ice.. they will survive the flight home... just some labour and effort to stow it on board and keep them cold. Akaroa Salmon is high quality being bred in ocean cages rather than fresh water. But as we all know... driving a car in singapore is such an ambition... when rental in NZ soooooo cheap... must die, die must drive. Unlike during the early days we had 4 nights with no standby... went all over the shop with SM Dino. Hope the injured crew recovers.. just one of those things in life. Flight goes on. Ah ya.. No angry lah.. Just joking lah..5 years junior..peace bruther ok ? Tire? not the FO! Today he is our Cpt on 777! That is why I always tell the stupid FO not to ask the stupid cabin crew when they are renting a car..will always get blamed ! Some CCs are rover ungrateful shits! Me & my hubby joined a local tour group to Italy, we were onboard flight SQ366 to Rome, while waiting for the toilet at the rear of the aircraft, one leading stewardess started chatting with me, asking me why I bother to join a local tour group, traveling with Singaporean, the experiencce is not "Funtatstic", should go self drive or F&E, as both of us are teaching in the school, we simply have not time in co-ordinating those hotel booking and planning tour itineraries, so we leave it to the professional. Then the LSS told me that, they are spending 5 nights in Rome, so they will be renting a car to tour to Pisa & Florence etc, well she sound to me that they knows Italy at their back of their hands. So while both of us in Pisa, we did bump into that LSS and few of their colleagues, but the journey from Rome to Pisa is approximately about 400km, as we were on a luxury coach with 45 seaters, sitting for about 5 hrs, we already feeling tired when we get there, don't talk about driving for such a long journey, guess what? I spoken to that LSS again, and she claimed that, after the Pisa visit, they are traveling to a small town known as Monte Vecchia to purchase Prada bags at the outlet. I can imaging with this sort of driving, where local are not used to driving long distance, accident may easily take place, when the drive doze off, wonder, why all these SQ cabin crew must travel to somewhere when they are in a foreign land, is that the typical SQ culture? The root cause of this tragedy lies in the CS' failure in not fastening his seat belt. This amounts to a failure in his personal duty to safeguard his own life. Insufficient layover time could also have made this worse, and going by the facts that are emerging, the outcome looks far from rosy. Insurance copmpanies are not going to pay claims without putting up a fight. This was clearly demonstrated when the late KY Leong's widow filed a $500,000 claim taken out on his accident policy. He had died when his car crashed that was triggered by a heart attack. The comments on this blog donot reflect a good image of the minds of the respective writers. THe court will deal with the facts first and foremost. Emotions and ranting are handled separately. Did KY's widow win the case? Win the case? She lost! She boasted to everyone she won the case. She had expressed her disappointment with the Insurance company to the media soon after her claims were not entertained. The Company rebutted her letter swift and sure. No not forget for one moment that insurance companies generally are prompt in collecting premiums but take a very long time when it comes to settling claims. Dear teachers.. In case you are not already aware... Cabin crew are generally quite stupid people. That is why they were hired.. so that they can be sacked without a fight! After all, its quiet a brainless job. You do not need to have much brains to be a CC. A good aptitude is to have a flair for conversation, able to add, subtract and divide, associate yourself with being away from base due to frequent travels and to be a good provider of excellent service. Also, a good CC should make it a point to keep his mind active and seek opportunities from travels and to enjoy time overseas. Some success stories from the ranks of CC are CEOs, Directors, Business people, millionaires, priests and nuns, counsellors, prosperous property and insurance agents, lawyers, musicians, jewellers and lots more. To suggest that CC are generally stupid is nonsense and uncalled for. HIRING AND FIRING IS THE SOLE PREROGATIVE OF EMPLOYERS IN SINGAPORE. It has nothing to do with CC level of intelligence! Many other countries around the world have this in common. The USA is always cited as a living example. The national gazettes, Employment Act and the Industrial Relations Act were quoted during an Industrial Arbitration Court dispute hearing when its President delivered his verdict on a case filed by the SIA Pilots Association years ago. At issue was the Association's contention that acceptance of SGP citizenship as a condition by the Company for promotion of SFO to Commanders was not in the spirit of the Collective Agreement. Another case involved a control staff who had been put on an inquiry to answert charges for taking money in exchange for fixing lucrative flights with CC. No evidence was uncovered. The HOD exercised the Company's prerogative by transferring him out of CC. He was free to appeal.